At Bassett Lock & Key we offer locksmith services to both the residential and commercial sector in and around Hampshire, operating in areas such as Southampton and Winchester. We are police registered/CRB checked and regularly work in conjuction with Hampshire police and Southampton city council in handling their locksmith needs. We offer a fast response and a ‘can do’ attitude, with no call out fees. A friendly, reliable and professional service to everyone for domestic and commercial work. All our work is guaranteed and carried out to a high standard. Bassett Lock & Key can supply and fit all makes of locks and hardware. The satisfaction of our customers is the number one priority at Bassett Lock and Key, see what they’re saying about us on our testimonials page. Realistic pricing and great work. I needed a locksmith for my daughter's house in Southampton to change 2 locks, and as I live in Reading I rang for quotes. Company 1- £108 plus VAT and they were pushing me to book, Company 2 £96 with VAT and this company told me would take over an hour, and up to an hour and a half . Company 3- £150. Then I rang Bassett Lock and Key and Simon Paull told me it was a short job and the cost was £75. Simon carried out the work quickly and I told that I was impressed as another company told me it would take over an hour and a half. I really recommend Bassett Lock and Key because as a customer you want to be treated with respect and honesty and not be ripped off . 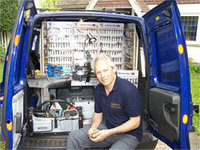 If you agree with me and need a locksmith then please give Simon a call. I first found Bassett Lock & Key when my garage door lock had been vandalised. Simon gave me great information about security and installed a new lock plus additional measures. We then contacted him again to change all our household door locks. Both times he was everything you could wish for ... Easy to contact and quick to respond. On time for the appointments we made. Informative and knowledgeable giving expert advice. Clean and tidy in his work. Courteous and kind. Great value for money. A truly excellent tradesman who's details I will be passing on to my friends and family. Simon was quick to answer my call when a UPVC handle broke off on our back door. He instantly suspected that the problem may be linked to our bi-fold doors being out of alignment and stayed until the root cause and the handle replacement were both complete. He could have easily just replaced the handle and be done in 10 mins but went over and above. Very impressed and would recommend Simon to anyone. Simon gave me an indication of the likely cost of the work when I phoned him. Being the middle of a Friday afternoon I was pleasantly surprised that he would be along as soon as possible to fix our locking problem. Disputes trying his best to repair the lock he reluctantly had to replace the mechanism. Would recommend him highly, no call out charge, fairly priced and he is a very pleasant guy. Simon came to change to lock on my back door. He let me know the cost on the phone when I arranged the appointment. He was very friendly and knowledgeable. While at my house he fixed two other things, that I asked about when he was there, for the same fee. I would wholeheartedly recommend him for a reliable service and excellent value. 10.30 pm at night - could not open the front door. Simon came within 10minutes & got me in. He came back the night day to adjust door catch. I am an existing customer & he did not charge me a penny! AMAZING.